Description: Birthday, Wedding, Baby Shower, Celebration, Anniversary and all other occasions! We use this bakery for cakes on order. I do not believe they have a store front anymore. For an event or just a treat, order cake/cupcakes from them- they are absolutely, positively, just incredibly DELICIOUS. Perfect balance of flavors- natural ingredients, not too sweet and beautifully done and decorated. Just really, really perfect. We used their services for our wedding back in 2012 and now we splurge on these cakes for every kids birthday - it has become a staple for our parties. A definite do-not-miss if you love delicious and pretty cakes! I chose Yuki's after reading great reviews and I definitely made the right choice. I hosted a baby shower and picked carrot cupcakes with cream cheese icing. They were fantastic! Many people at the shower commented how delicious the cupcakes were. and indeed they were exceptional. It should be noted that the Yukis I went to was a little bit off guy street so I think they have moved location. My family and friends have been ordering cakes from Yuki for years. Her designs are works of art and her cakes and the best I've ever eaten. For your next event, do not hpthink twice about ordering from her, but be sure to call in advance. She is in high demand! We were referred to Yuki by a close friend after she supplied their wedding cake. 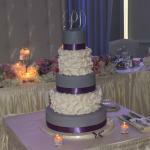 We actually attended their wedding and we absolutely loved how it looked and tasted. My wife and I arranged a meeting with Yuki to design our wedding cake. She was very attentive and personable during the cake tasting (great flavours: vanilla lemon/strawberry shortcake/any of the chocolates). Whatever inspiration you have for your cake, she can definitely make it happen. Yuki's Bakery has gotten repeat business from our family: birthday/wedding/shower cakes and they have all been amazing! Been to Yuki Bakery? Share your experiences!